”These guys play with dust in their Levis and the road their hearts”. We are delighted to host The Dodge Brothers performing songs from their long-awaited new album Drive Train and bringing their exuberant hybrid of country blues, rockabilly, jugband and skiffle back to Out to Lunch. You will be one of the first to hear this long-awaited new album, coming 5 years since The Sun Set and described as “wonderful stuff” by Radio 2 presenter Bob Harris. Firmly rooted in these traditions The Dodge Brothers bring to them a freshness that has feet stomping and hands clapping from California to Cropredy, from the Mississippi to the New Forest. Their songs feature vocal virtuosity and heartfelt harmonies underpinned by joyous guitars, thumping double bass and rattlin’ snare and washboard. 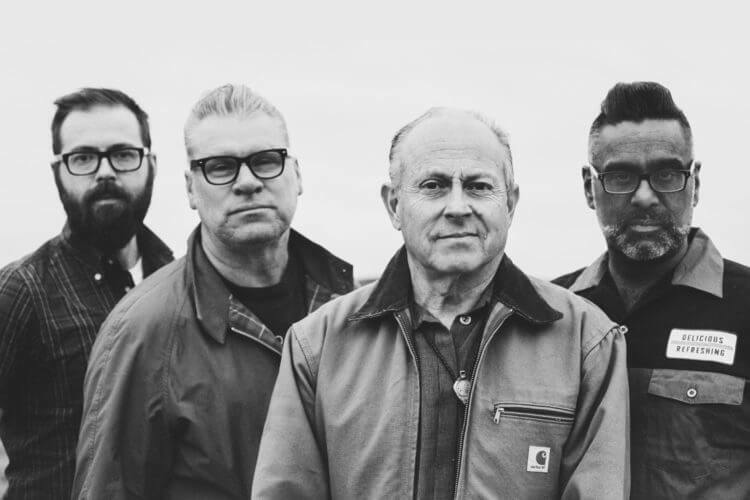 The Dodge Brothers features Mike Hammond (lead guitar, lead vocals, banjo), Mark Kermode (bass, harmonica, vocals), Aly Hirji (rhythm guitar, mandolin, vocals) and Alex Hammond (washboard, snare drum, percussion). Their music has an authentically American tang – lead guitarist/vocalist Mike Hammond was raised in Alabama and his youthful musical travels took him all over the southern and western USA – but with a strong British perspective from Culture Show presenter and film critic Mark Kermode.